There are certain instances where words fail to aptly describe an album. 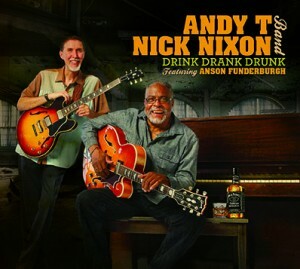 Such is the case with Drink, Drank, Drunk, the debut album for the Andy T-Nick Nixon Band. In short, this record is musicianship at its highest level, which should come as no surprise considering the personnel on the album. The personnel on this record is nothing short of incredible. John Garza (bass) and Danny Cochran (drums) anchor a fabulous rhythm section for most of the tracks, while the keyboarding duo of Kevin McKendree (piano) and Larry van Loon (organ) provide the perfect seasoning for “No End to the Blues,” possibly the best of the twelve outstanding tracks on the record. Funderburgh’s classic Texas sound is featured on several tracks, the best of which being the album’s lone instrumental: “Dos Danos.” And, of course, the album wouldn’t be the same if it weren’t for the saxophone background and solos by the supremely talented Ron Jones, who adds just the right amount of jazz to the picture. Additionally, every other player on this album deserves recognition, but there simply isn’t space enough to do justice to Christian Dozzler’s piano and accordion playing that adds some nice zydeco to the mix, Markey’s outstanding background vocals, or any of the other countless contributions to this record. And, after saying all of that, I realize that I’ve failed to mention the two men who front the band: Andy “T” Talamantez on guitar and James “Nick” Nixon. Andy T, a veteran of Guitar Shorty’s band, has a gorgeous, clean tone that he adapts well to any style of blues. As for Nixon, he’s a veteran blues vocalist from Memphis, TN, and he’s got the soul, the gruff, and the phrasing to prove it. While it’s too early in the year to say for sure, Drink, Drank, Drunk looks to be one of the top new releases of 2013. – Have You Seen My Monkey?